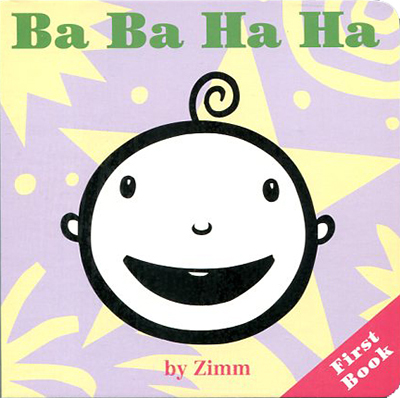 Ba Ba Ha Ha was created for my daughter, Lila, when she was just under a year old. I made hundreds of drawings and showed them to her one at a time. The ones she looked at longest and smiled at were set aside. The ones she ignored, I tossed. I went on like this for quite some time, re-testing each image with Lila to make sure they really did work. I ended up with the final drawings that make up Ba Ba Ha Ha. Six years later, in 1996, Harper Collins brought the book into print. A year later, in 1997, the publisher informed me they would no longer continue to publish it, even though they had sold out. Lila is now 29 years old and lives in Oakland, California. I'm proud to say she is a graduate of Pratt Institute with a BFA in creative writing. Between 1997 and today, I have spent a great deal of time programming and creating complex systems for the internet. I formed a small company that builds and supports internet shopping carts and all types of other systems in wide use on the internet. In all of that time, I have never given up hope that this little book will make its way back into the hands of toddlers, where it belongs. The book I have printed is an exact duplicate of the original book. I thought it was important to make it EXACTLY the same because to this day, I am really not sure what makes them special to little people. There is something about them, I don't know what, that toddlers are simply drawn to.